By all accounts, CodeWorks — a touring conference produced by the same people who publish php|architect Magazine — was a big success. Although I was exhausted from all the travel by the time we made it to NY, I'm really glad I took the time to participate. Judging by the nice comments left on Twitter and Joind.in, everyone really liked my talks. Comments like "this was my favorite talk of the day" and "by far the most entertaining presentation" are especially uplifting. I put a lot of effort into my talks, and I really appreciate when people take the time to let me know when I've done a good job. Thank you so much! Just had quite possibly the best veggie burger I've ever had. Ever. Thank you, Siggy's in NYC, you have made my day! For lunch the next day, I took everyone to Grimaldi's for the best pizza in the universe, but the real highlight of the day was the beer dinner at Beer Table I had been planning. 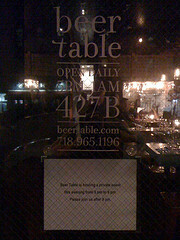 Beer Table is a local bar in Park Slope operated by Justin and Tricia Philips. The beer selection is admittedly overpriced, but it's worth it for a great selection, an intimate atmosphere, and very good food. When I first spoke to Justin about hosting a beer dinner there, he noted that Beer Table has never been closed to the public, but there's a first time for everything. Half of the dinner was sponsored by the fine people at echolibre, a web development company based in Dublin that is the home of respected developers like David Coallier and Helgi Þormar Þorbjörnsson. The other half was sponsored by a small group of people including Jon Tan, Andrei Zmievski, Alan Colville, and myself. We're not quite ready to talk about what we're up to, but we hope to be soon. I'll add my slides to SlideShare in the next few days. When I do, I'll mention it on Twitter. Derick is currently editing a video he took of one of my talks. Unfortunately, it was one I gave very early in the morning, so I wasn't at my best, but it should be better than the slides alone. This is the last of my conference appearances for the year. Now it's time to focus on my new company. More about that soon!